What exactly is soul? And what constitutes soullessness? A lot of people will contend that most new objects lack soul. Whether it’s a piece of architecture, furniture or a car, there’s a commonly held notion that new means souless and old means soulful. Case-in-point: I have several European friends who don’t like new houses or apartments and would much prefer to live in a building which is, at a bare minimum, 50 years old. They’re a little suspicious of new developments no matter how amazing or functional they actually may be. In their eyes, they are somehow lacking. Another example: some of my colleagues who work for modified car magazines maintain that ’90s cars are superior to new, 2010-era machines. For them, a 15-year-old car carries with it a feeling and driving experience that has since been extinguished by auto manufacturers. Is this really the case or are they just nostalgic? Many of us are a little guilty of looking backwards in time, to a Golden Era where everything was more interesting and desirable than in the current moment. From an automotive perspective, you can see this trend reflected both in the increased interest in retro-modified cars and the growth of historic race-series and festivals. Many of you reading this right now may one day decide that the 2010s are what it’s about. All the hybrid, electric and fuel-cell cars which come afterwards won’t have the same soul as machines from the ’10s. Or you may have already decided that the 1980s were the best time period, having sprung up such new classics as the M3, AE86, 959, F40, CRX and R32 GT-R among others. And of these cars I just listed, do you think that they were considered to have soul at the time? Or do you think that we just perceive these chassis have accrued soul the older they get? Does the build-up of nostalgia for the past make us believe that older is better? 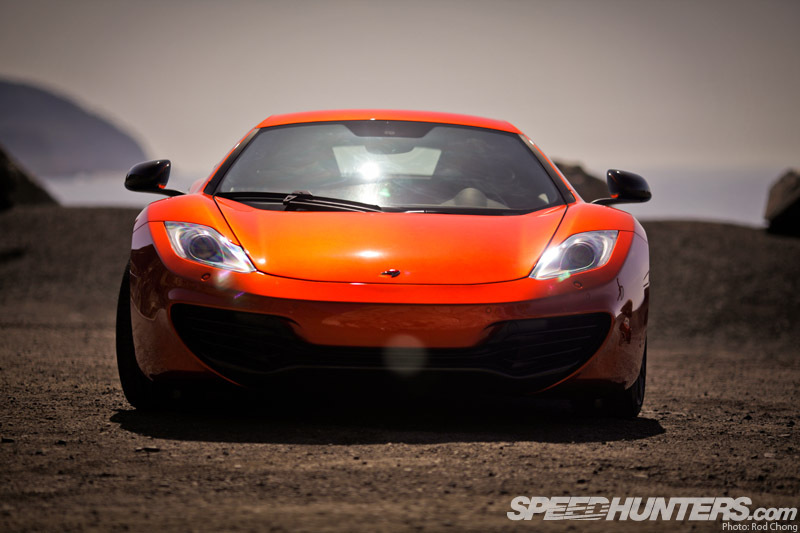 The reason I’m pondering this question is that I’ve seen reviews of the McLaren MP4-12C which say the car lacks soul. But having experienced the car myself, I just don’t agree. I am someone who believes that anyone who views new, cutting-edge design as lacking soul is being blinded by nostalgia. In my opinion, older does not necessarily mean better. It’s simply that old things have had time to accrue associations with the past. Time also has a way of filtering out the bad from the good, the fads from the movements. The bad is buried, while greatness builds into legend. How many people remember all the disposable pop music from the 1970s? All those records have long since been turned into landfill or recycled into dashboards. I’ll argue this point, that soul can be quantified by whether or not an object has these two elements: excellence and passion. If the creators of any said car were totally committed to excellence, no matter what type of car they are designing and engineering, I believe this will show through in the final product – be it the lines of the car, the technology, the engineering or the ergonomics. A commitment to excellence also means that no corners were cut which would risk destroying the integrity of the product, and certainly at no time in the production process would any designer, engineer or manager have said ‘that’s good enough’. You can be certain that this ethos of excellence permeates every molecule of the MP4-12C and throughout the McLaren organization. How else would they have become multiple Formula One champions? We can also look at the element of passion along the same lines. If the sum total of everyone who is involved with a car’s inception, development and production-process is deeply passionate about the project, I also think this will show in the final product. Are the people who form the company we know as McLaren passionate about what they do and the products they make? You better believe it. I’ve visited McLaren’s Woking headquarters and can directly attest that the feeling in the air inside their MTC building is the same feeling which has been injected into the MP4-12C. How can we put this feeling into words? I woke up that morning jittery with excitement – it was going to be a very special day indeed. How often to you get to pilot such an exclusive machine on such an iconic road? I once did a brief stint living in Malibu, but it’s been well over a decade since I’d been anywhere near this incredible coastline. Now that I’m a European resident, just the notion of the Pacific Coast Highway is enough to send a flurry of images though my mind’s eye. It embodies the romance of California beach-culture, Hollywood and the perceived glamour of Los Angeles. 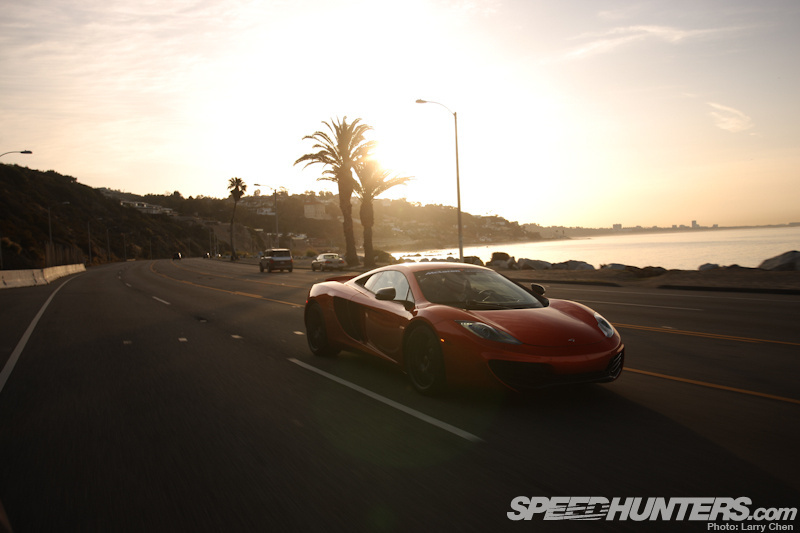 And so, finally, the early-morning McLaren dream-drive came to reality. As I walked into my Long Beach hotel’s parking garage, I kept reminding myself to just be relaxed, stay in the moment and enjoy the day as it came. Inhale, exhale, left, right, throttle, brake, upshift, downshift. 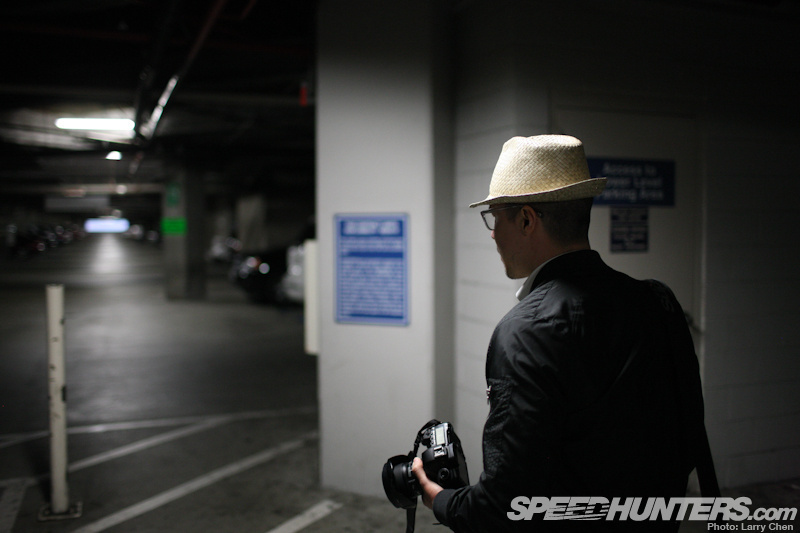 The drive started under the watchful camera lens of Speedhunters’ own Larry Chen, who would be shooting the proceedings with a bit of car-to-car photography action. Here he caught me leaving the parking garage at the Hyatt Regency Long Beach. I pulled out onto the freeway and there was again that feeling of total integration and intuitive immersion from the McLaren. The entirety of the car immediately wrapped around my senses, from the position of the eye-line to the layout of the controls and the shifter paddle at my finger tips. Everything felt so natural. I was instantly pulled into a different state of mind-machine awareness. 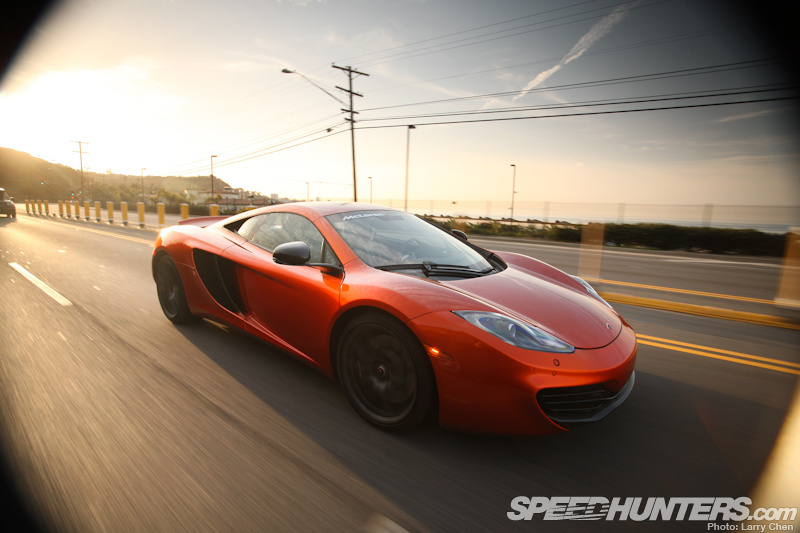 Driving the MP4-12C could be compared to using an iPhone for the first time. The interface is so intuitive, so well thought out, that you feel instantly at home, and soon don’t even notice the actual instrument itself. With the McLaren, the feeling of being sat in a car dissolves; operating the controls becomes a direct extension of your senses. I think a lot of this comes from your position in the car itself. With the engine behind and an open view of the front fenders, you get a clear sense of being propelled down the road. 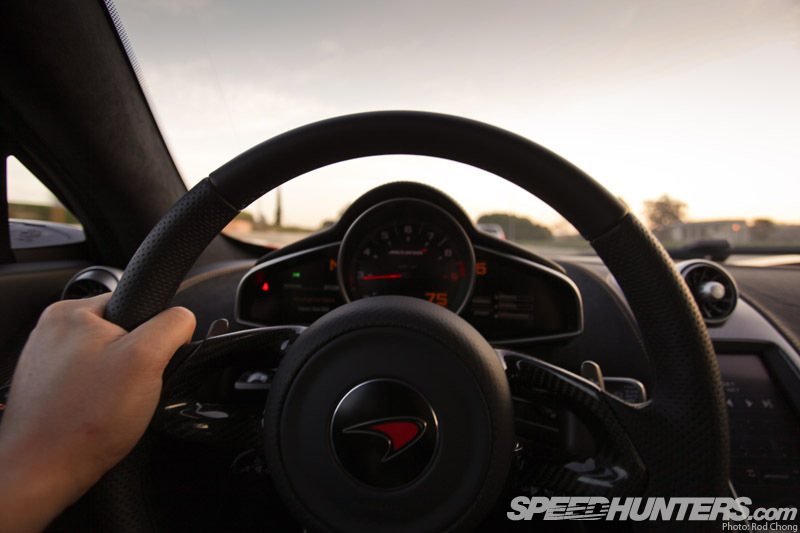 When piloting the car you feel directly connected to the machine through the feel and weight of the steering, the transmission shifting and the suspension inputs coming in through the seat. At no point did the car’s electronic brain or driver aides create the impression that there was a layer between me, the driver, and the physical action of the car’s body, suspension and tires. Instead, the experience was seamless. 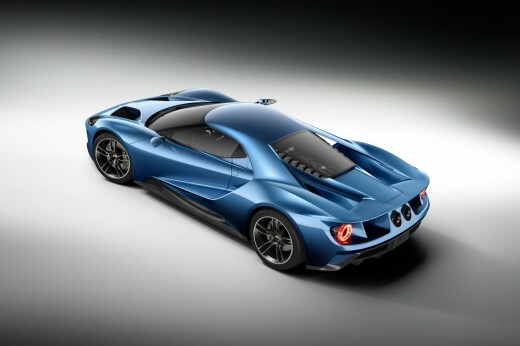 I need to mention here that I have a real pet-peeve with modern, high-performance cars which isolate the driver from being integrated into the inner workings of the machine’s performance. I don’t like cars which on paper can do amazing 0-60 times and high g-force cornering, but which lack any modicum of feeling. 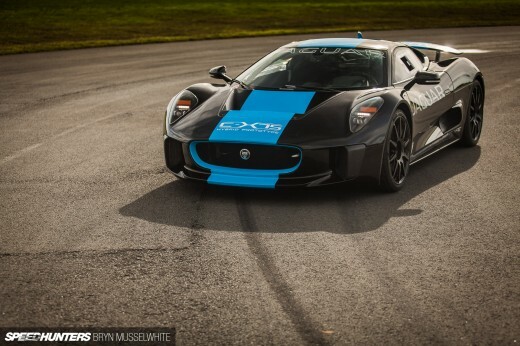 Such cars are more like virtual-reality simulations of high speed driving. 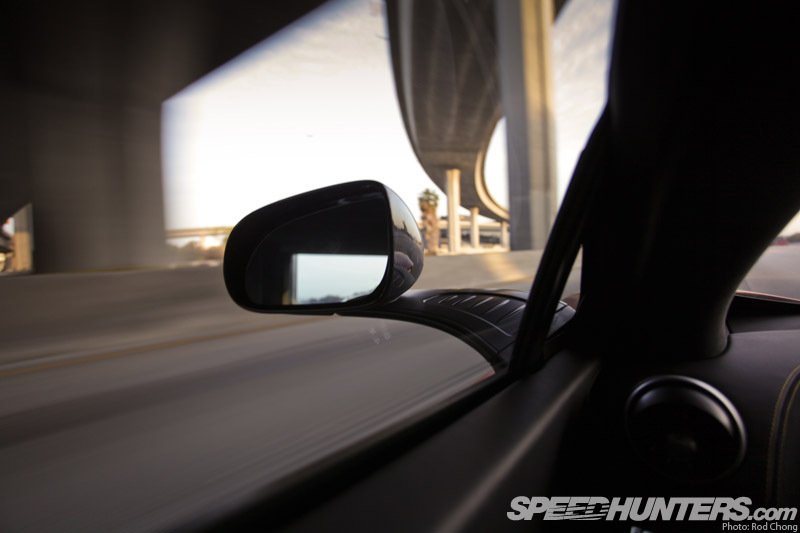 Yes, you are going fast, but there’s not much else to do other than point the car where to go – it does all the work for you. There are so many electronic systems between you and the road that a sense of numbness quickly sets in. You end up watching the car drive itself, as an isolated observer. Now it may be that the brain of the McLaren MP4-12c is indeed doing a huge amount of computational work on the driver’s behalf, but at no point does it make you feel like a bit-part player in the proceedings. And this, from an interface perspective is a fantastic achievement. I should also mention here how astounded I was by the car’s ride quality. LA freeways are normally pretty rough places to drive. But the McLaren glided over them like it was a big luxury saloon. Amazing. 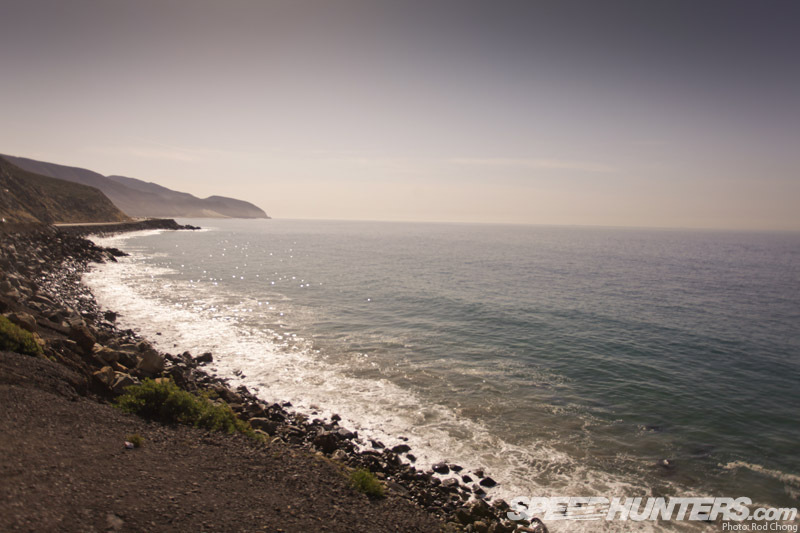 …and I was on that iconic piece of road, the Pacific Coast Highway, heading north towards Malibu. 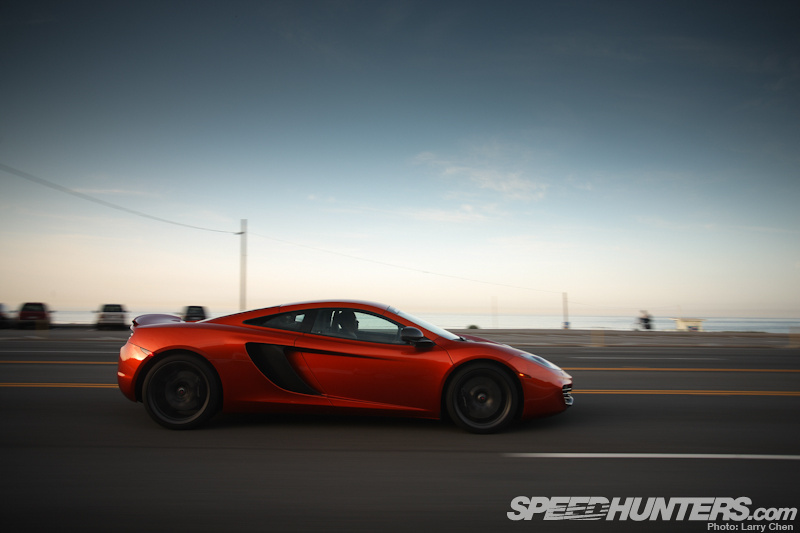 The McLaren is an absolute joy to drive at any speed. 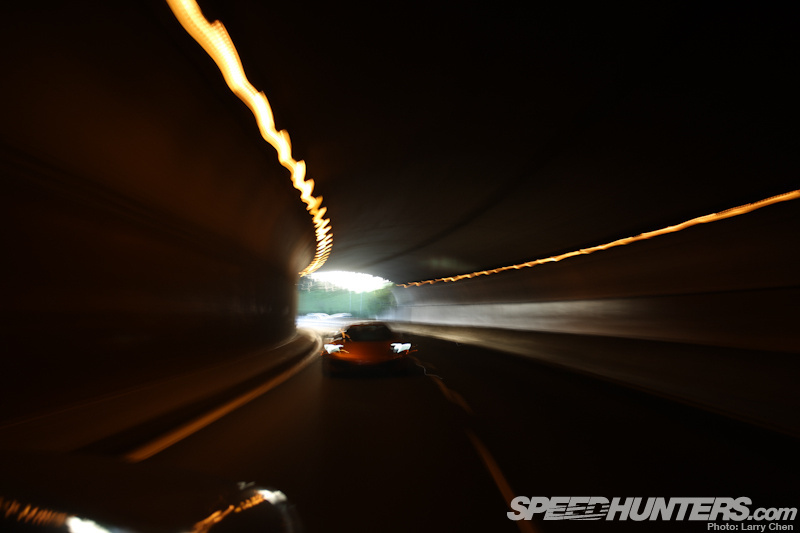 Yes, mashing the throttle and bashing up through the gears is an absolute rush, but for me what distinguishes it from other supercars is the fact that at no point did the car feel ‘bored’ by normal driving conditions. Larry and I had chosen to depart Long Beach around 06:30 in the morning to find some good lighting conditions for the day’s drive. This also meant a lack of traffic, allowing me to relax and enjoy the view of the Pacific Ocean out of the corner of my eye. 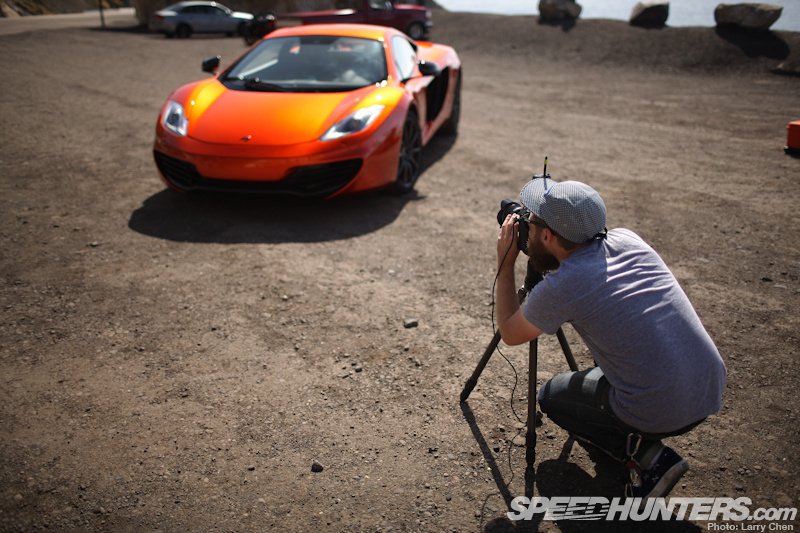 Except for one excited Speedhunter and one orange supercar. 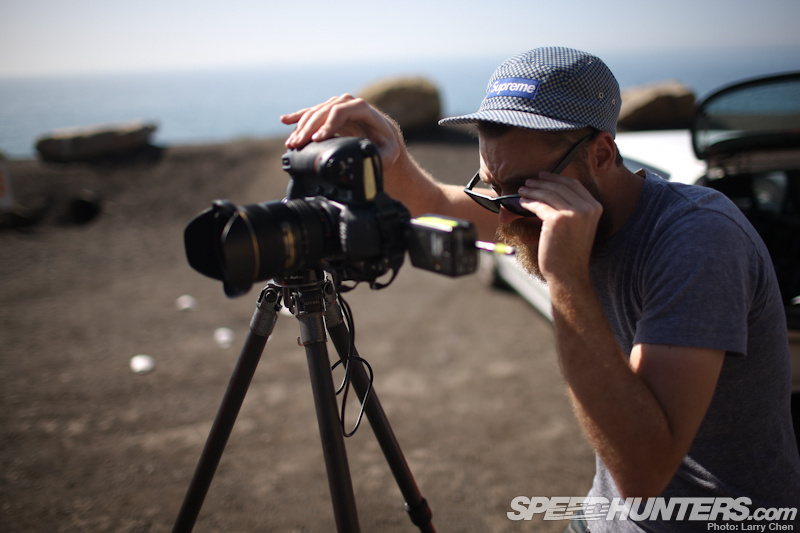 …never mind the guy with the camera though! …and I dutifully obliged. Larry later noted that the McLaren gave the appearance of being set in a fast-forward time warp. As I launched the car past him, there was no sense of weight transfer or rearward squat. The car simply shot forward, seemingly defying the laws of physics. 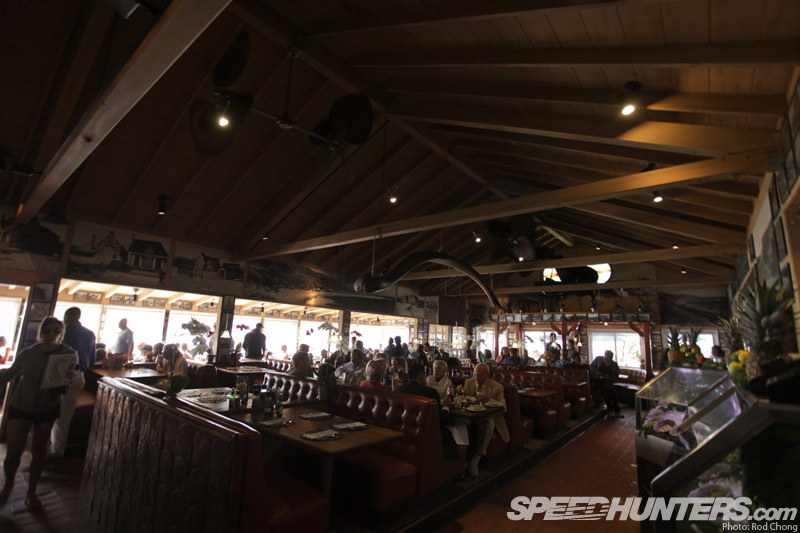 Car-to-car shoots with Larry done, we parked up at Bob Morris’ Beach Cafe in Paradise Cove, Malibu, for a spot of Sunday breakfast. 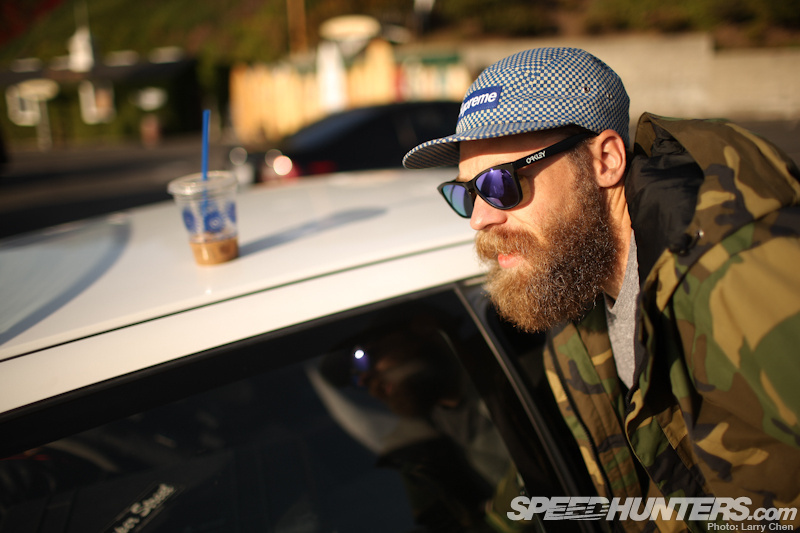 It was here that we met up with one of the new members of the Speedhunters crew: Sean Klingelhoefer. The whole point of the Dream Drive is to give you the reader (especially those of you from the far-flung corners of the globe) a taste not only of the car we are driving but also the roadway experience itself. 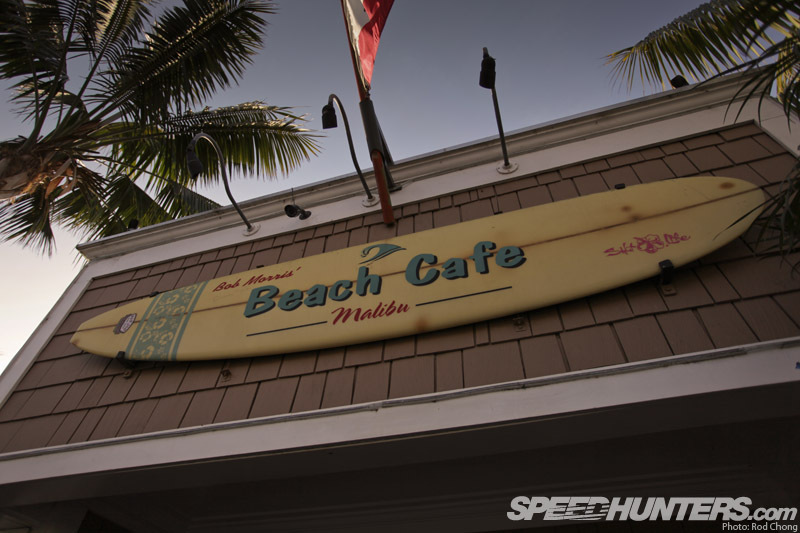 Hitting up a beach-side café was a perfect way to get a taste of the whole Malibu scene. So this is what a beach-side café on the PCH looks like. Although Malibu is mostly a playground for Hollywood’s elite these days, there is still the feel of traditional, laid-back beach culture in Bob Morris’ restaurant. It was low-key and friendly, without an ounce of pretension. Ah, the romance of California. Okay, we aren’t showing you cars as such, but the California coast has given rise to so many car cultures that we want to show you more of the location itself in this story. 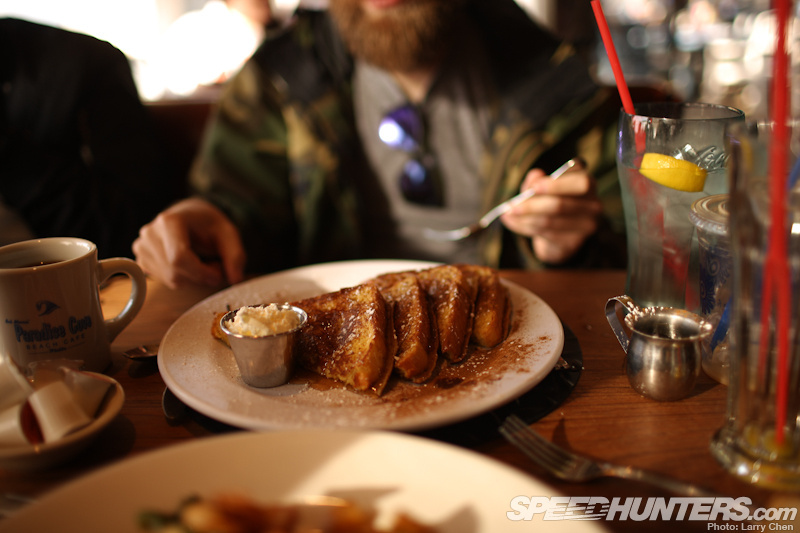 …over French Toast, a most American of breakfast options. Bellies full and caffeine levels topped up, we set off again up the PCH. I took the time to quietly take in my final observations of the car. My conclusion: driving the MP4-12C puts you, the driver, right at its center. It’s not screaming ‘I am a Supercar’ all the time, nor is it attempting to compete with your place as the driver of the car. It has a quiet confidence and is simply too sophisticated to resort to making such a tasteless fuss about itself. We pulled off the PCH and set up camp at the Point Mugu look-out point. This would be our base for Sean to do his thing. It was time for him to take the reigns for a full-feature photo shoot. …and his assistant, Jack Reynolds. My role became that of car-minder, charged with constantly repositioning it for the ideal photographic compositions. While I have 20 years experience doing film and video shoots, this was my first taste of working with the type of compositing-lead photoshoots that Sean Klingelhoefer is reknowned for. This is precisely why I organised a shoot with him. I wanted to see how he works and what techniques are used to arrive at his painterly-styled images. 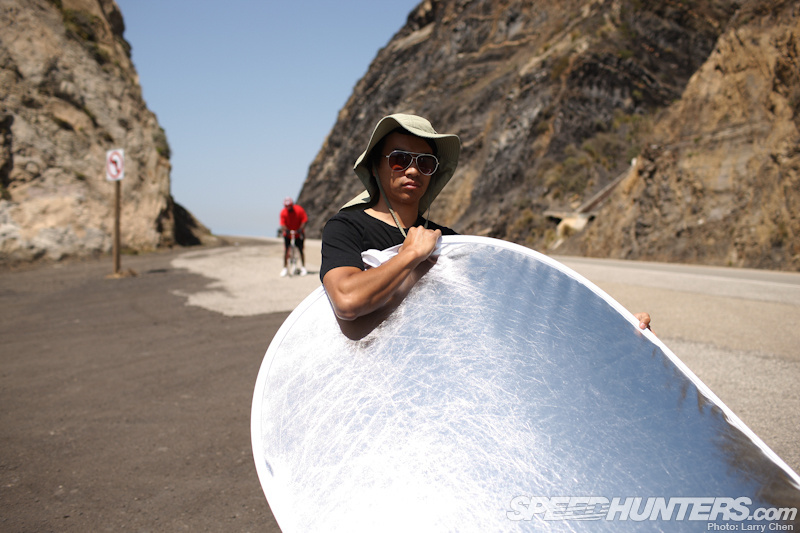 Anyway, I tried to stay out of Sean’s way and busied myself taking in the stunning background to Point Mugu. And what a location it is, with the glory of the California coast stretching away into the distance. It’s quite hard to believe that we were but a short drive away from the urban sprawl of Los Angeles proper. Another section of the look-out point showcased an old, disused portion of the PCH, slowly decaying back into the natural surroundings. Meanwhile the McLaren was starting to draw a crowd from the locals and tourists alike. Most of them had no idea what kind of car it was. The name ‘McLaren’ didn’t seem to gain any recognition either. But that didn’t seem to matter. They all recognized a supercar when they saw it. There was no doubt this was an exclusive machine of the highest aspiration. Soon McLaren’s delivery service arrived to pick up the car. This was my last moment with the MP4-12C and I took a second to gather my thoughts together about this fabulous machine. I returned to the question of soul versus soullessness. 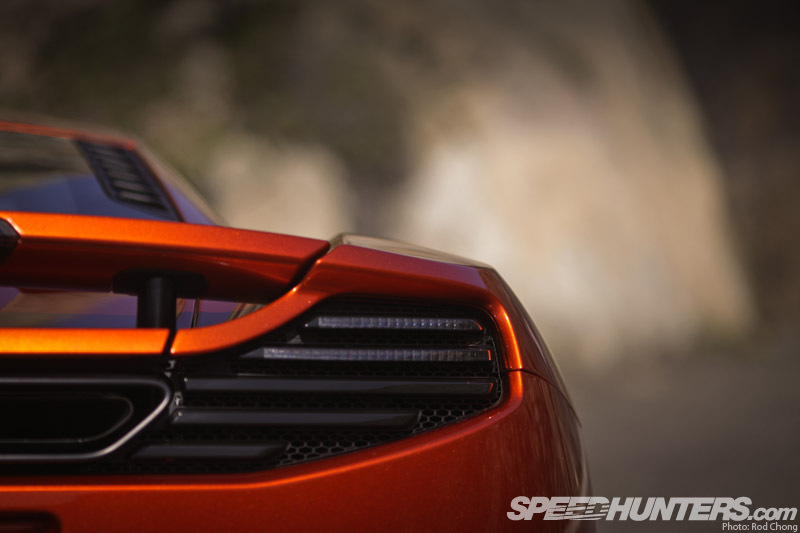 From my perspective the MP4-12C is full of soul. But not in the usual way. It’s not backwards-looking, nor does it trade on a feeling of nostalgia. Compared to the more established supercar builders who’ve been hammering us with their brand messages for many decades, this is McLaren’s first serious bid to establish a road-car division. Yet it restrains itself from showing off or advertising excess, despite its maker’s F1 pedigree. It’s a subtle, refined creation with a quiet yet powerful attitude. 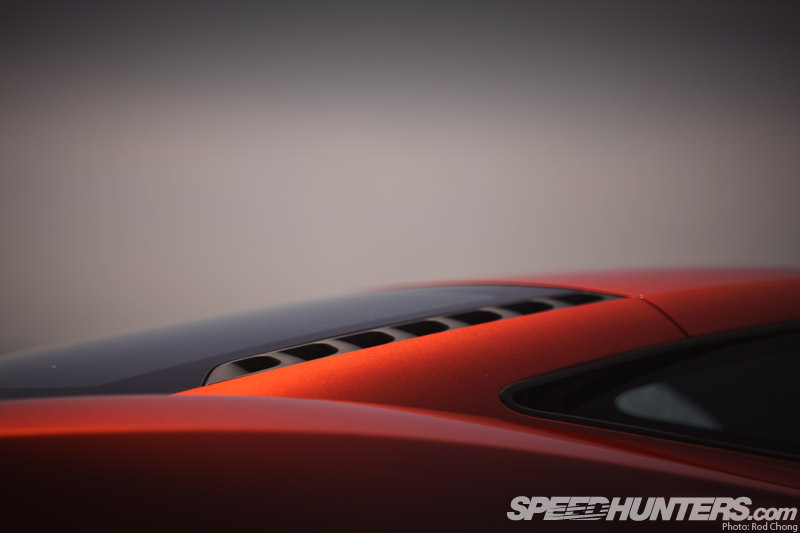 The soul of the MP4-12C is futuristic, it has geometric lines and a computerized voice. It’s a vision of a world that has yet to be realized. 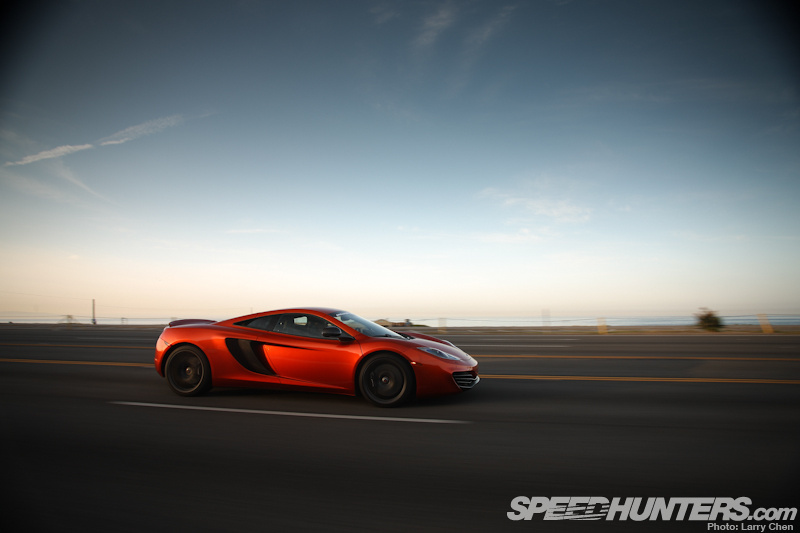 We’d like to thank McLaren for the use of the MP4-12C. 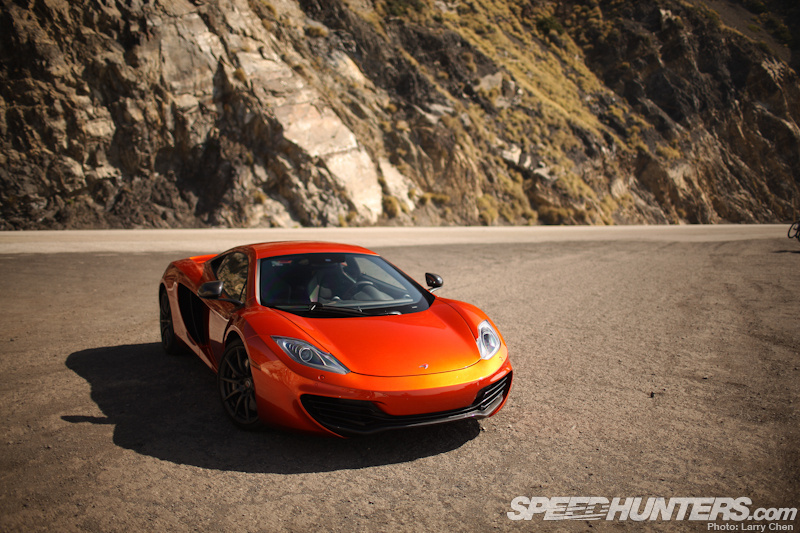 interesting, many magazines, roadtests say the biggest problem with the MP4-12C is.... it lacks soul. Soul?? Well the name for starters MP4-12C wtf is with that it need a proper name imo what a mouthful. MP4-12C what a terrible name it even sounds like it has no soul. One thing's for sure -- Sean's beard has soul! And by soul I mean the distinct possibility of various small creatures living in it I kid, I kid (and congrats on the new gig, Sean). In all seriousness, great read and a I have to agree with Rod's interpretation of soul. A lot of so-called experts have knocked the R35 GT-R for lacking soul but having spent some time in one around a race track I can tell you it sure as hell gave me a soul a serious stirring. I suspect the MP4-12C would do the same, despite it's name (though maybe it's name was inspired by R2-D2, in which case I already feel a sense of nostalgia for it). 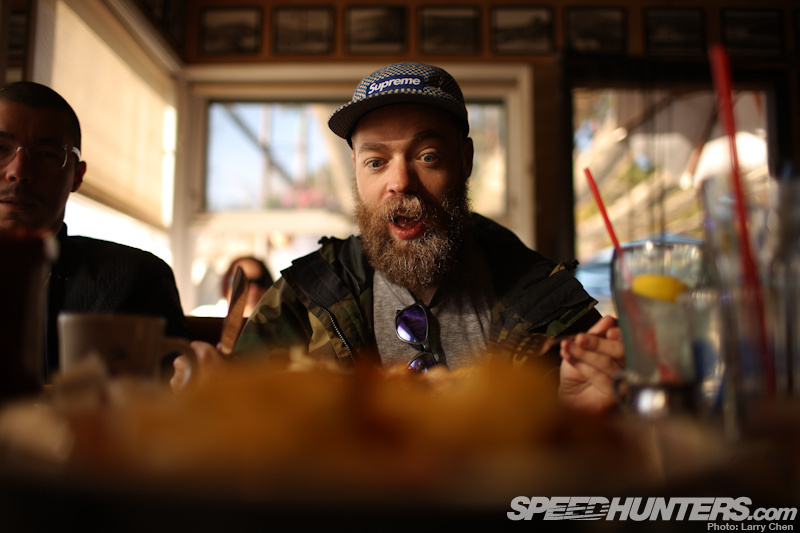 I'll tell you one thing, Sean's beard sure has soul! And by soul I mean the distinct possibility of small creatures living in it. I kid, I kid (and congrats on the new gig, Sean). Nice second installment of the Dream Drive! 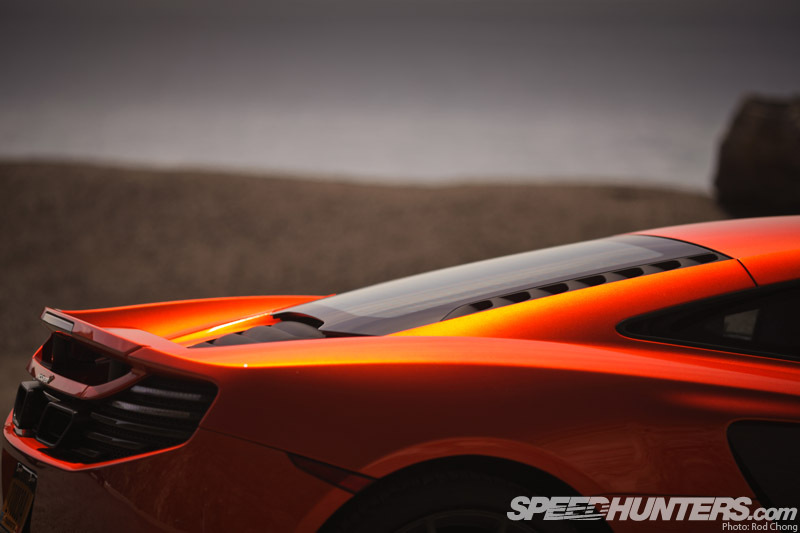 MP4-12C is named in honor of the company's many successful Formula 1 cars, 2012 F1 car bares the MP4-22 moniker. A man is allowed to dream! Anyways, it was a great read as always. The intro itself was amazing. That's also a pretty nice 1D Sean's got there. 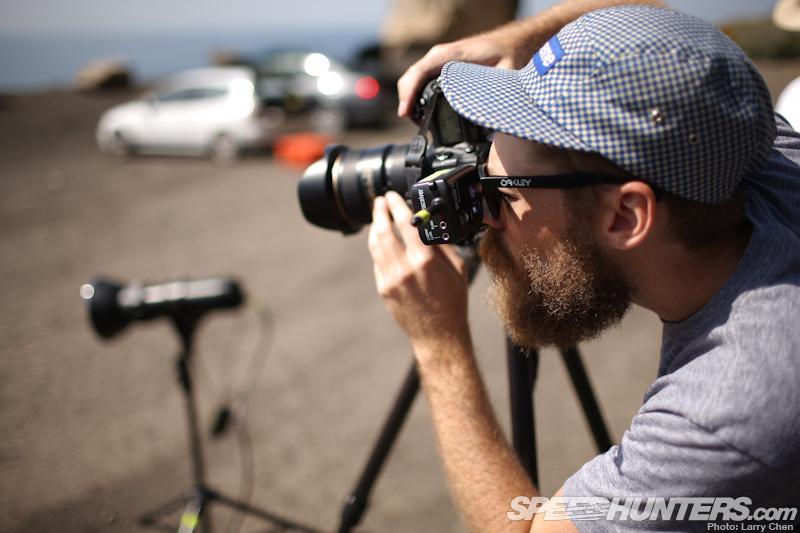 I assumed he had a 5D2 like a lot of you guys have. Legit! Again I haven't driven the car so cannot really comment, but I think it might part of a phenomenon we see on the Internet all the time. The first person to say something starts a trend, and usually the bandwagon soon follows. 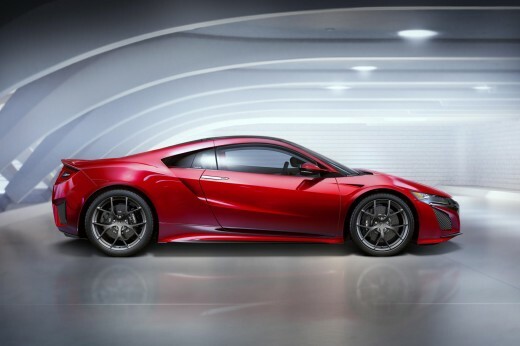 Therein, whoever first said "the McLaren lacks sould" likely paved the way for others to continue this trend. Believe it or not, many times media outlets influence one another, and also many times journalists are all driving a car for the fist time at the same event and will likely discuss details about a car over dinner. It isn't too hard to imagine how one person's opinion could have influenced a whole group of journalists, I've witnessed it in person before, albeit not with this particular car. Just food for thought. @Dave Pratte lol thanks Dave, the beard is actually gone at the moment... however I have a way of seemingly always having a beard when I'm photographed, so it wouldn't surprise me if the next time the audience sees me I will be bearded once again! @sean klingelhoefer There will be no photographs of Sean while beardless from me. I can promise you that. Until you've seen one up-close, you cannot comment on it. I liked it after seeing pictures, but definitely could see where people who thought it was a tad bland were coming from. Saw it at the Auto Show in February, and boy oh boy, no other car at the show, save for maybe the ZondaR, attracted attention like the MP4-12C. Park an orange MP4-12C next to a red 458. and I can promise you, you won't even notice the Ferrari. I guess French Toast is as American as French Fries? Loved this car. When riding in it, it was amazing how you could adjust the suspension and transmission on the fly and the car would change in seconds to match the road ahead. Thanks Rod and Larry for this great opportunity to experience this dream drive. Here we come Pagani Huayra prototype? @sean klingelhoefer @LouisYio Sean, please add the Tail of the Dragon in a turbocharged 20B-swapped FD RX-7 (Phil Sohn's current project comes to mind) to that list you're going to knock out by year's end. Or if that's too specific (LOL), I'll take a test drive story in any sort of cool modified car that's a little more attainable than the MP4-12C-3.14159. Don't get me wrong, love the fap-worthy super cars, but variety is the spice of life and I'm guessing we all love a good modified street car around here. no engine shots? come on guys! So basically this story is about Rod, Sean and Larry? I see. I loved this article and everything it entailed. 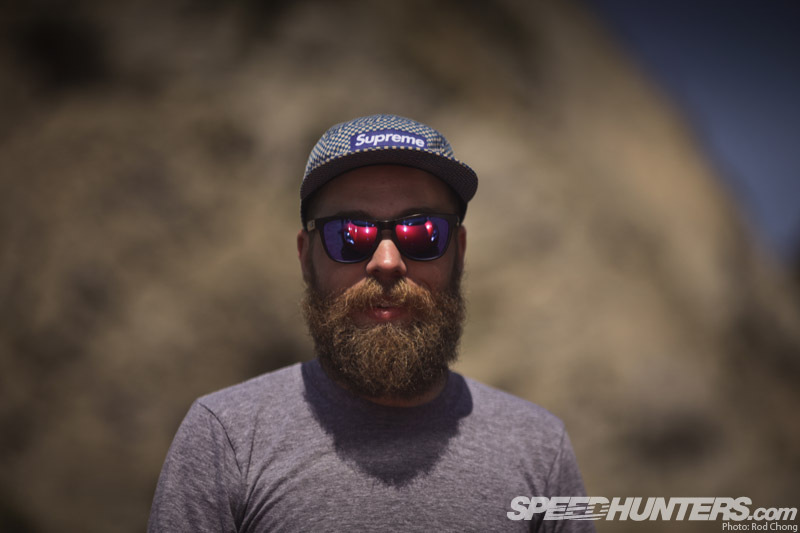 Sean- Great Beard. Rod- Your vocabulary never ceases to amaze me (or should I say make me feel like I am with you guys as you are producing these articles). Larry- Get beck in the window before you hurt yourself! Overall though, I am going to agree with everything said in this article. I am biased towards 80's cars because I have owned nothing but second-gen RX-7's, but I can for sure see the sports and super cars we have now being the 'nostalgic' cars 20-30 years from now. Think of it this way, we had the same attitude back in every era in regards to the iconic saying: they just don't make them how they used to. For sure it's not easy to say that new supercars haven't soul or something like that, but in my opinion it's true when you talking about the new compact sportcars like abarth, corsa opc etc. i'm still dreaming the impreza wrx ('90s of course huhu!) ^^ bye! @JDMized Not so much m8. It's about the car and our direct experience with it. @zamm333 Ahh those were in part1 where we shot the bare chassis. @Larry Chen indeed m8. Very hard to find the stuff here in Europe! We are also thinking that Dream Drives could be any type of car, as long as it's interesting. 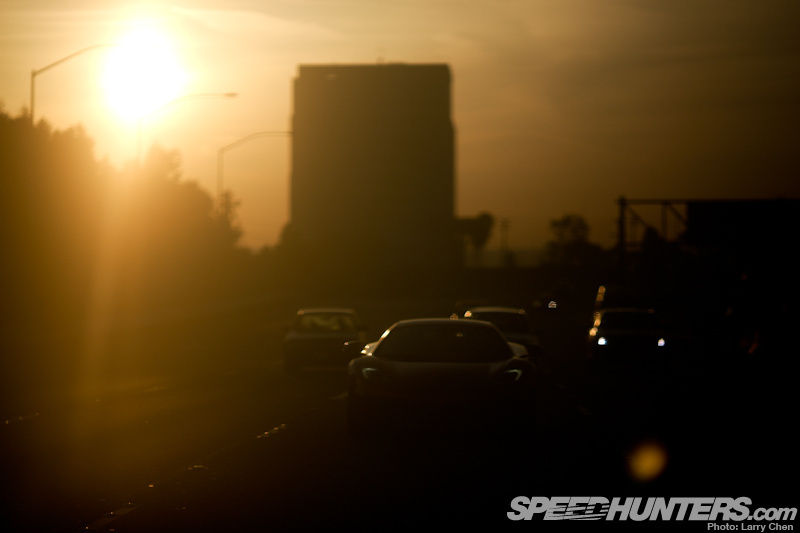 Mulholland drive in a AE86 for example I'm sure would be a great drive. I guess its due to we have a perception of soul, and how we have had a connection with soul for over the last 50yrs for example. Now with the MP4-12C it seems that the way soul was perceived isn't how it should be felt now, it's broken free of the mold. It's like we won't fully know how to feel it as the car is years ahead of its time, just like the McLaren F1 GT-R was back in the 90's. 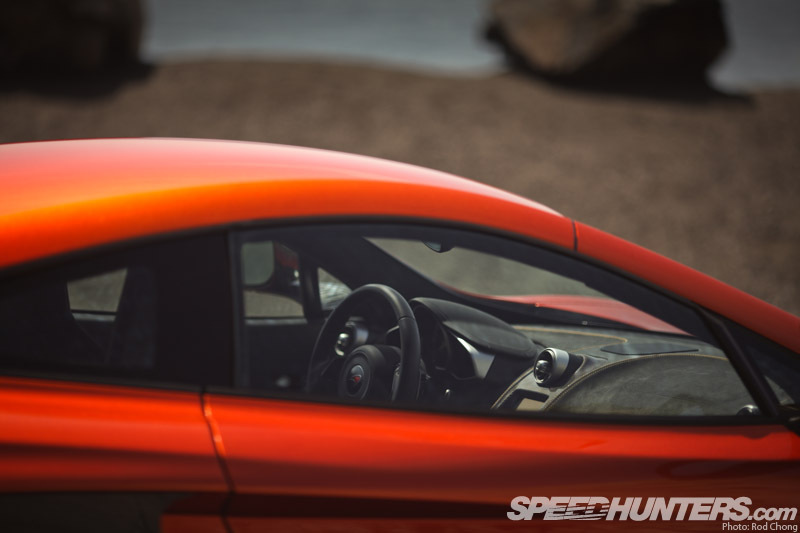 "With the McLaren, the feeling of being sat in a car dissolves; operating the controls becomes a direct extension of your senses. "....Maybe that's wrong with the car. A machine with no personality who prefers to make you feel like home but never let's you know what she like or what she hates...Like a boring horse who will obbey everytime...and not at all like a nervous stallion who allways love even if he brakes your nack. Because that is he's nature. I think I'll prefer the "cavalino rampante" for myself. awesome post guys! keep up the good work!! you continue to out do yourselves with everyone of these 'dream drive' posts....even though its only just clocked up its 2nd post! @james740 It actually is the exact place from the first Fast and Furious funny enough. Larry mentioned this along the way. @greenroadster Certainly a valid point. Mulholland Drive would be nice, Mulholland Hwy is better. Latigo Cyn, Yerba Buena, would all be miraculous. But I would love for someone to seriously consider three roads.... Hwy 120 up and over Yosemite is insanely beautiful but, I beg for Hwy 49, especially the section between Mariposa and Coulterville (one of the most technical and awe-ispiring sections of road out there...and I drive the Malibu Canyons all the time so those are big words) But the one I would love to see the most? Hwy 36 in Northern California. Pristine. 140 miles of curvy and enchanting road set in the emerald mountains and red woods of coastal Northern Calif. Its amazing. Even Top Gear would fall in love with this road. Although I agree with what Rod said about Excellence and Passion put into McLaren, the term Soul is a bit misleading. The main point why McLaren doesn't have a soul is because it is too mechanic just like what you mentioned, it can totally operate itself. The haydays of Lamborghini's for example, they are totally hard to drive which made them iconic. Human beings have a soul because we all know we are not perfect. It is this imperfection that makes all the difference, the character, the good and bad. When the McLaren F1 was launched, it sets the standard for supercars, a measuring stick for the supercars of the 2000's. Did it have ABS? Traction control? Turbos? No, everything is raw and to push it, you need to be a better driver. That's soul right there. @james740 A couple of Nissan SR20's would pull a premium one week before race wars. Great article! 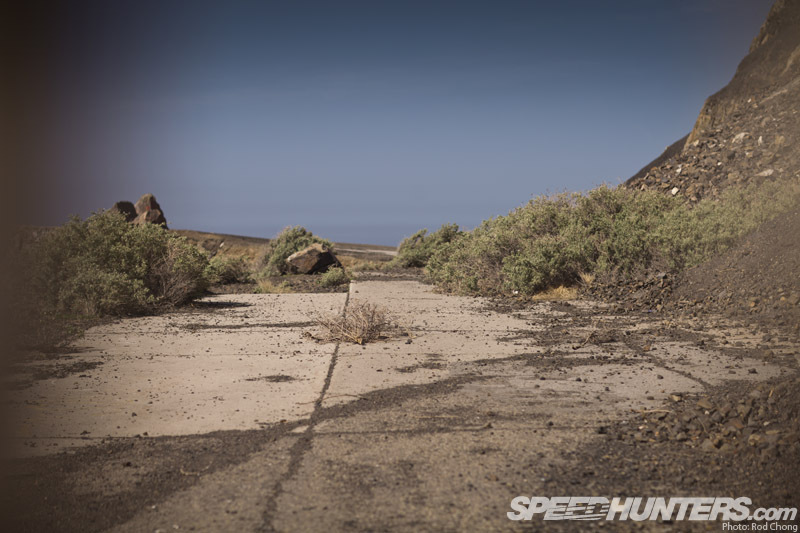 I'm loving the new deeper direction that Speedhunters has been taking. Keep it up guys! Maybe it's just me but that little thing that pops up saying how many new comments there are below is annoying as can be. hehe https://vimeo.com/38222120 The car right same shoot ? Fantastic work, guys. I love seeing the team get together and work on shoots as a group. As for soul, I feel that "soul" is relative. Soul is what you feel when you encounter a car, regardless of what the car is. A normal car that conjures up deep personal emotions has more soul than a random sports car driving by. Soul is built by experience and feelings. I think the people that "get" the MP4-12C are the ones that idolized the original F1 road car, and like me, had posters of it on their walls and pictures of it taped up in their high school lockers. I also had the fortune to see one of the ex-factory LeMans cars on track (and sit in it!) at a historic race many years ago. It was a definite "bucket list" moment. I get the new car. I think it's "soul" lives in the history and what it represents, not what it is. @RodChong So, what you guys are saying is the likes of Evo, 5th Gear, Top Gear, Car and some of the owners who post on Pistonheads are wrong and while it maybe my favorite blog you, on the internet are correct?I believe one of the first people who said it lacked soul was an owner who is a race driver who also owns a 458. What comparable cars have you driven Rod? 458? In english please? What about the two engines from Nissan? I would love to see you guys trying a JDM-spec drift car into some of the european best roads - Stelvio Pass-Col de Turin. How about that? @greenroadster It's a Fast and Furious reference. Are the higher end GTs that I have taken out in recent times. The 458 is definitely on the list. I had honestly never considered the MP4 as a soulful car but having read your piece and the beautiful photography (really appreciate the non-car shots to give a flavor of the setting) I can see a soul in it now, like you said at the end, a technical soul. Like a Schwarzenegger in Terminator 2, all robot and computer and precision, a clinical start, but able to connect on a deeper level. It's an interesting and totally new spin on car soul that I've never considered before. So thanks for making me think and giving some great art! Awesome, Rod! What a dream! the mp4 is such an amazing car! i love it!